KIEV, Ukraine -- Fighting continues to gradually intensify in eastern Ukraine. The Kremlin-backed militants are now using heavy weapons, including tanks, artillery and ferocious Grad rocket systems, sporadically. Russia's President Vladimir Putin attends a meeting with India's Prime Minister Narendra Modi at the Kremlin in Moscow, Russia, December 24. Moscow's rationale behind this latest escalation is to achieve a frozen conflict by gradually sabotaging the execution of the Minsk II ceasefire agreement. 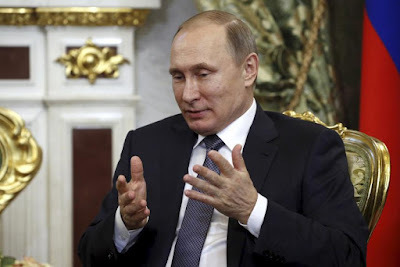 Russian President Vladimir Putin likely realizes that his offensive in the Donbass has essentially stalled and that for now he cannot take more Ukrainian territory, not without sustaining heavy casualties among his regular military forces and triggering additional Western sanctions. And so it seems that, in order to achieve its long-term strategic goals, the Kremlin's leadership is emphasizing alternative aspects of hybrid warfare. According to retired U.S. Army General Wesley Clark, former NATO Supreme Allied Commander, who visited Ukraine seven times in 2015, "Ukraine is a work in progress by Putin. He has multiple channels to attack Ukraine, economically, politically, diplomatically, militarily." Recent developments on the security front within Ukraine's borders are disturbing. The Ukrainian security service (SBU) and other law enforcement agencies report a significant increase in acts of sabotage and terrorism. According to SBU official Oleksandr Tkachuk, "Russian special services are intensifying their activities in peaceful cities, trying to destabilize the situation and trying to show that Ukrainian law enforcement bodies and Ukrainian authorities are not able to protect their citizens." The Ukrainian authorities, to their credit, have been discovering these plots, arresting Russian agents and confiscating caches of weapons and explosives throughout Ukraine (as opposed to mainly in the front-line areas as used to be the case). On December 10, the SBU neutralized a terrorist group in Kiev and Kharkiv consisting of eight members with clear links to the Russian security services, three of whom were Russian citizens. They possessed automatic weapons, state-of-the-art equipment and large quantities of ammunition and explosives. The SBU believes they were planning to carry out acts of sabotage and terrorism in Kiev and other urban centers of Ukraine. During this operation, the terrorists put up fierce resistance, which resulted in the death of an SBU officer and a militant, while two other were wounded. This, unfortunately, is only one of many similar recent occurrences. The rise of plots like these is a serious and dangerous development. Combatting these type of threats is more difficult than repelling the attacks on the eastern front lines. If this issue is not dealt with in short order, it could bring about a major setback to the significant progress made to date toward the stabilization of Ukraine and Europe. Furthermore, if combined with the military escalation on the front lines, the Kremlin's continued political and economic coercion, painfully slow reforms by the government of Ukraine and declining living standards for a majority of the population, Ukraine could, potentially, become a failed state in time—which is exactly what Moscow wants. To a significant extent, Ukraine's survival depends on successfully confronting the terrorist tactics of the Kremlin. The free world, in turn, cannot afford a failed state in the heart of Europe. It is paramount that Ukraine and the West acknowledge this new and increasing asymmetric threat and deal with it rapidly and decisively. Ukraine needs to utilize every tool it has to detect, contain and remove the threat. The West should place more substantial pressure on Moscow to force Putin to stop sponsoring terrorism in Ukraine. Without a doubt, sabotage and terrorism in Ukraine must be dealt with, but Ukrainians will have to bear the brunt of that effort. The West can assist in providing Ukraine with the sophisticated technology (or sharing the data developed by its technology) to keep track of some of the communications and detect explosive devices, but the real pay-off will be in infiltrating hostile networks and groups, and in motivating Ukrainian citizens to report suspicious activity. Ukrainians - like all former citizens of the USSR - tend to be very watchful, and notice small changes that would frequently escape notice in western countries. Although there are enough potential "domestic" terrorists who would be prepared to serve Russia for pay, Ukraine should maintain and expand its policy of restricting the flow of Russians into the country. Not unlike the concerns that the US and EU have with ISIS operatives in the midst of the tide of refugees, Ukraine will have to be careful with the flow of goods and people from Russia - even returning Ukrainians. That is another reason why the construction of a border "wall" (which could be as simple as trip wires and electronic detectors along a heavily restricted, uninhabited and monitored border zone) is so important. If the frequency of terrorist attacks or the loss and destructiveness of those attacks increases, it may be time for Ukraine to introduce capital punishment for even minimal but knowing support of Russian espionage and terrorist activity in Ukraine; and, in the alternative, offer substantial rewards to those who disclose such activity and cells. Lastly, for every terrorist act or sabotage, Ukraine must train and deploy operatives - including Special Ops forces - to hit back with greater impact on Russians, Russian collaborators, facilities and materiel in the Donbass region and do everything possible to make their presence there risky and costly. The Kremlin must be made to pay a price for its continued efforts to "make Ukraine a failed state".